Valentine’s Day is all about love. What a special thing to celebrate! Despite what romantic comedies and diamond advertisements you’ve seen, love isn’t always about two people in a relationship. This Valentine’s Day, Maybe you are celebrating the steps you’ve taken towards loving yourself. Taking the time to acknowledge what serves you and what doesn’t, what makes you feel joy and what makes you feel like the best version of yourself. Celebrate the love that your body gives you! Another day to breathe in and out, another day that your body carries you to the beauty that is your life. Celebrate THAT love today. Look back at how far you’ve come! Look forward to where you will be! Another amazing thing about love, is that it is everywhere – especially in your friends. Friends seems like such a underwhelming word for these people in your life, the ones you talk to daily, the ones you’ve known for years of your life. Celebrate them this year. Thank them for all they’ve done for you, whether they know it or not. Here’s a little blog on how to throw a love party. The best kind of party! Bake Valentine’s Day Funfetti Cupcakes! Not only are they like, the best cupcakes in existence, but baking with your friends is always fun. Buy your favorite pizza toppings/cheese/sauce as you choose. Our favorite sauce to use is actually Prego! because calories do not count on Valentine’s Day. Also, when else will you have an excuse to buy the color-themed M&M’s, Dove Chocolates or Reese’s Hearts?? Of course, WINE. Rose, or Champagne. A fun activity you could do is each write an anonymous love letter to your friends, explaining why you love them as a friends and what your favorite things about them are. This year on the day of love – take the time to say it out loud, write it down, sing louder to your favorite love song. You are made of love, and the world has so much more to give you. How amazing is that!? Happy Valentine’s Day – to you and YOUR love. Happy Happy Valentine’s Day Babes! 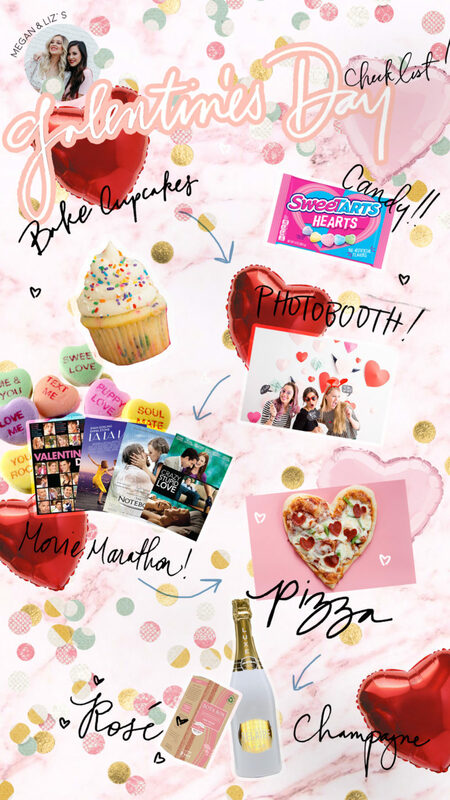 This entry was posted in Home, Liz, Megan, News and tagged galentines, guide, love, megan and liz, valentines. Bookmark the permalink.